I think I spoke too soon in my last post when I said that we still had many more summer nights left to spend outside, for just a few days later it snowed. Yes – Snow. The mountains were covered in clouds for days, and when they cleared, there were white dusted peaks as far as the eye could see. Now, being a Canadian girl this shouldn’t shock me too much, I remember once in Banff it snowed in the middle of July, but what surprised me the most was how fast the weather changed, one week it was 35 degrees, and the next week it had dropped down to 8. So, Fall has arrived here in the Alps, and I embrace it. Bring on the cold, the fog and the colours. Bring on the wool socks and warm cups of tea. Bring on the apples, the pumpkins and the pies. Bring on the comfort, the cozy and the cuddles. Bring on Fall. This is my first fall recipe, filling the house with the smells that remind me of home. 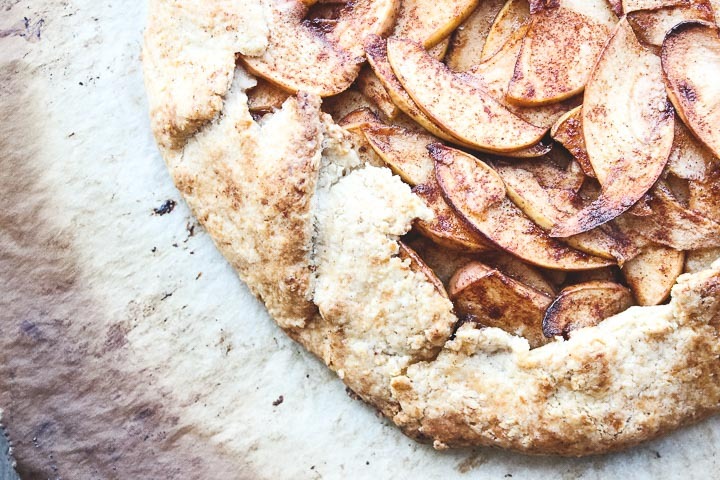 A galette is basically a lazy girl’s pie. No fancy lattice work needed, no cutting or shaping. The filling is the star here, and the messier the better. Think – rustic. Happy Fall! Eat for breakfast the next day. Just found your blog today. I’m loving it. Thanks so much for the healthy approach to recipes!